On arrival on Howrah Beach, I chose not to deviate to the Shoreline Shopping Centre, having no desire for shopping and because the fresh air and walking experience was such a joy. The long Howrah Beach was almost deserted, however occasionally happy dogs and mostly happy owners were enjoying themselves; I am never sure who is taking who for a walk. I was fascinated by the man who declared he was deaf and then told me his dog was deaf, yet they both seemed to communicate well and understand each other. 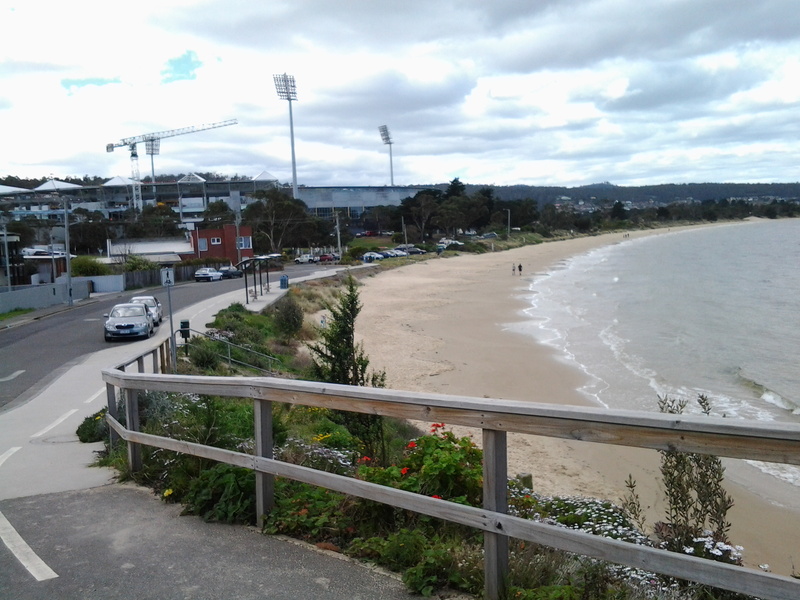 The photo above shows the stretch ahead of me as I started along Howrah Beach. 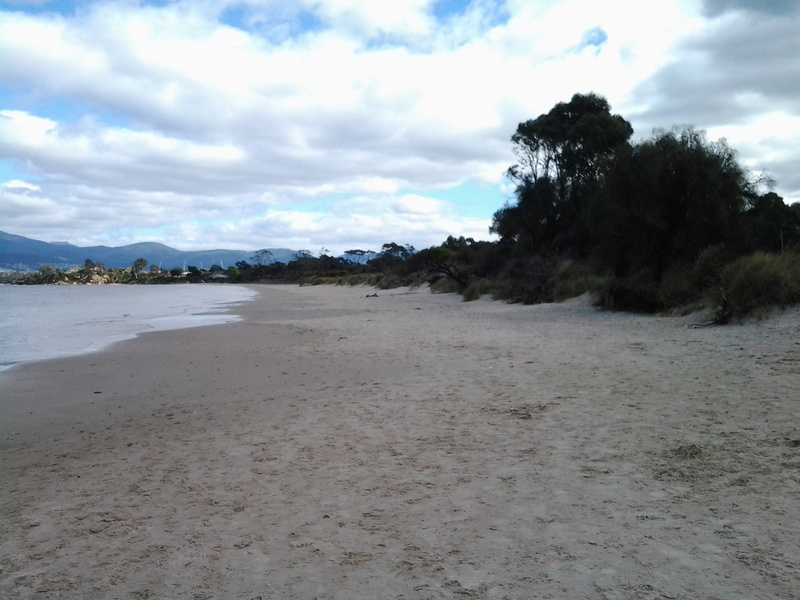 The photo below shows the Beach when I had walked half its length. The sky gathered clouds, and the onshore breeze cooled the air as I walked. 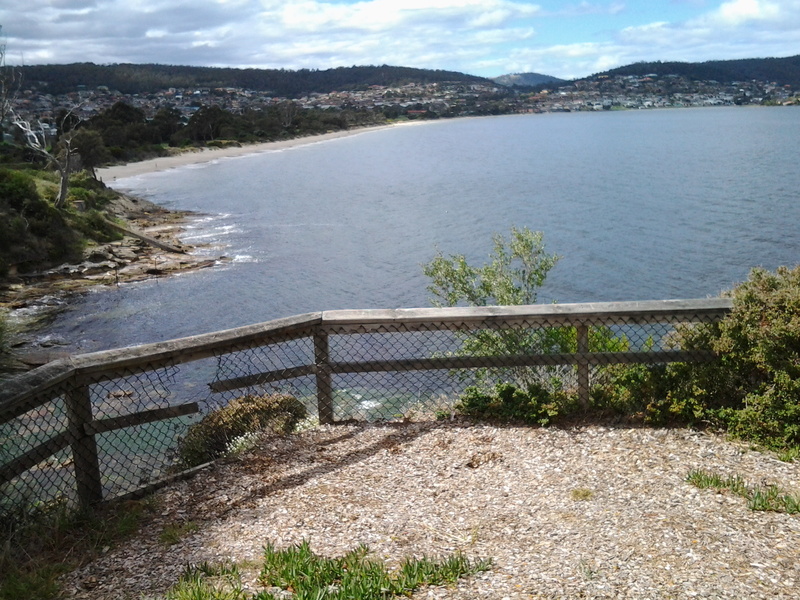 Before long I reached Second Bluff at the end of the Howrah Beach, and walked up and along the gravel pathway around this headland. At both the southern and northern ends of Second Bluff it is easily possible to walk off towards roads and, in the distance, to reach the main connecting route, Clarence Street, along which buses run regularly. While walking around this Bluff, I passed some large Australian native Leptospermum trees in full flower; their snow-white petals presented a spectacular display. Off and on I noticed bright bursts of fleshy native pigface acting as ground cover, with its purple-pink flowers made brilliant by the sunlight. 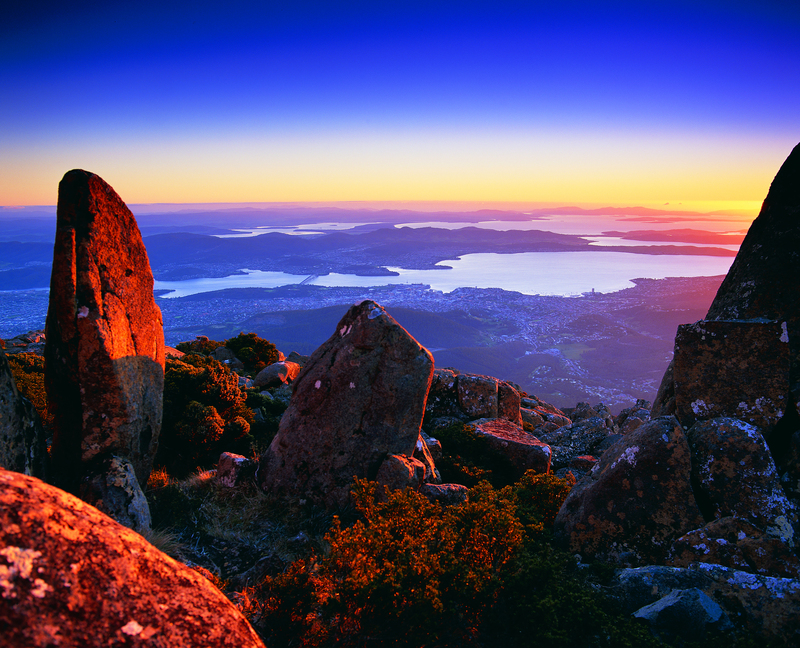 I was afforded spectacular views back to Howrah, Tranmere, Droughty Hill, across the opening of Ralph’s Bay, and of Gellibrand Point and Fort Hill on the South Arm peninsula. 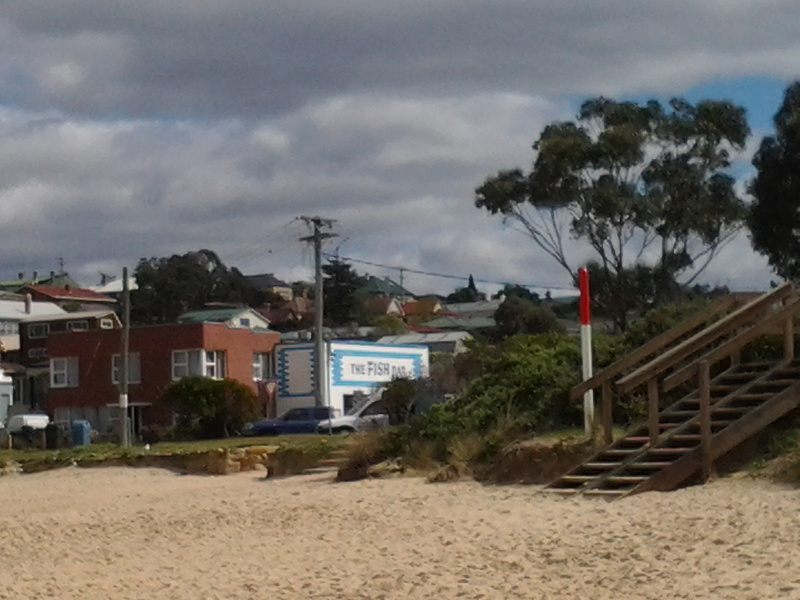 From time to time tall white poles with red tops are positioned along the beach to indicate walkways to the Clarence Foreshore Trail behind the dunes and then the roads and suburban houses of Bellerive. 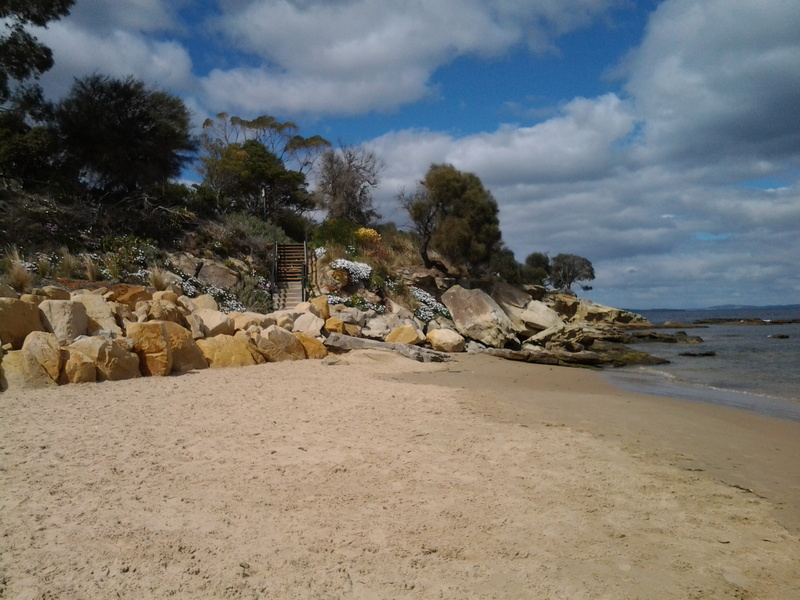 Bellerive Beach is much frequented by fitness fanatics, walkers, joggers, kids, families, individuals, and dogs on leads with owners. 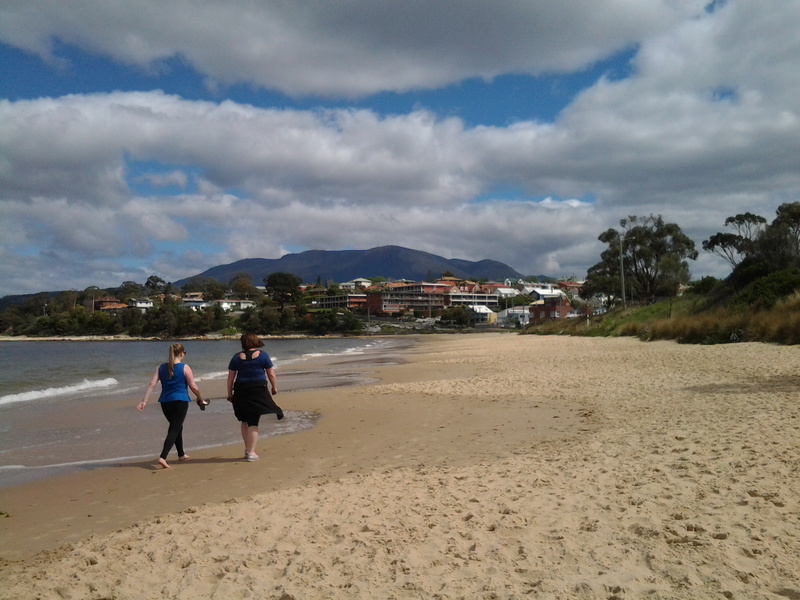 The clean sand, the tide moving the Derwent up and down the beach, and the startling prominence of Mount Wellington are always welcome. 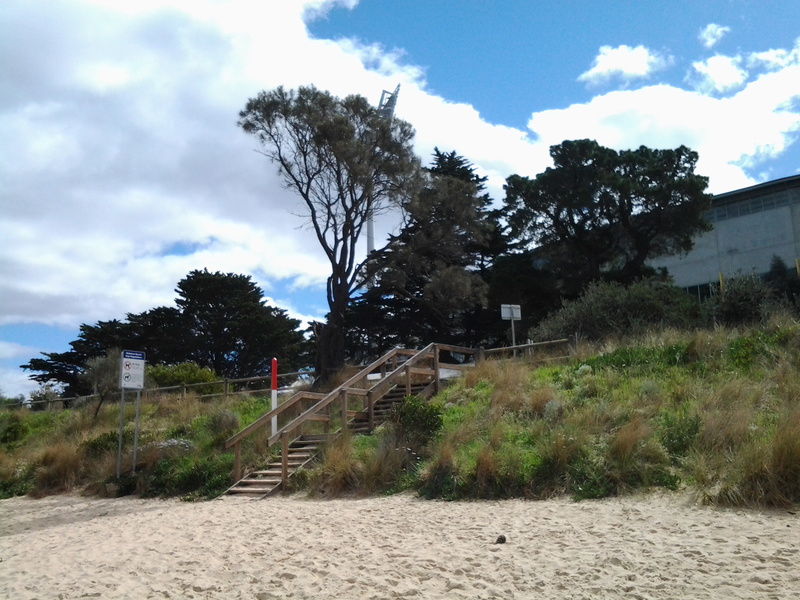 Near the far end of the Bellerive Beach, a massive structure looms above a row of tall pine trees. This is Blundstone Arena, once known as the Bellerive Cricket Ground. This sportsground, as a national venue for international and local cricket games in the summer, also hosts major AFL (Australian Rules Football) and state level games during the winter months. Between Blundstone Arena and the beach are public toilets along the edge of the Clarence Foreshore Trail. Further on and next to the Trail, an outdoor adult gym inspires beach visitors and picnickers to push and pull and otherwise move their bodies. From here you can see a blue and white painted building standing prominently. This is Bellerive Beach’s Fish Bar where fresh fish and other seafood is battered or crumbed and cooked while patrons wait. Dining in or taking away are the two options; the weather and wind generally controls whether I take a fresh cooked meal and sit on the edge of the beach with friends. 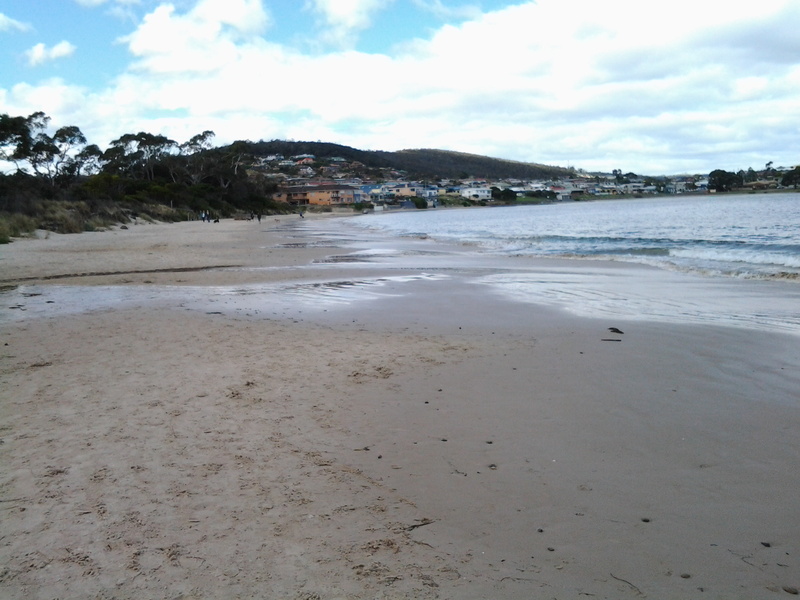 I live in Bellerive and so I know very well this Beach and all the delights which it offers. On this walk as usual, I brought my own packed lunch so I passed the Fish Bar and sat towards the end of the beach, and munched and contemplated the leisurely activity of others. 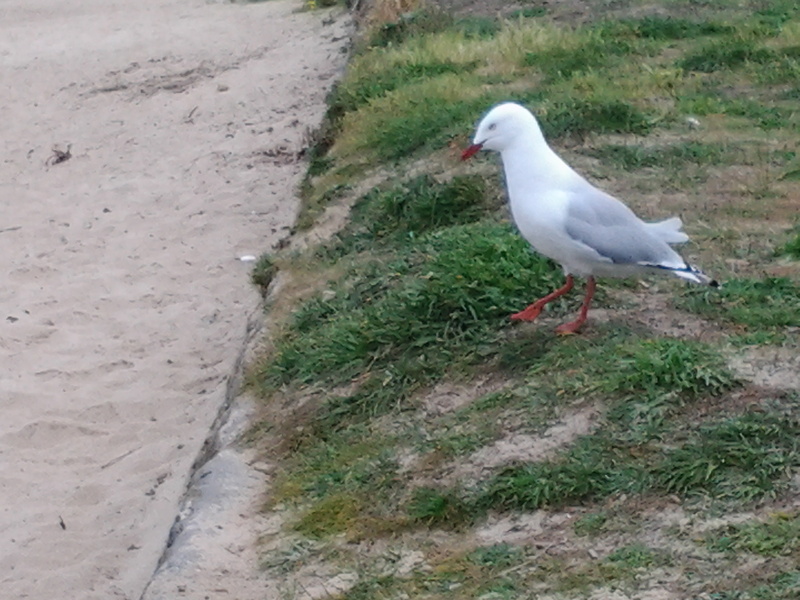 A simple pleasure amidst the flighty flashing of hungry squawking silver gulls, all expecting to be fed. 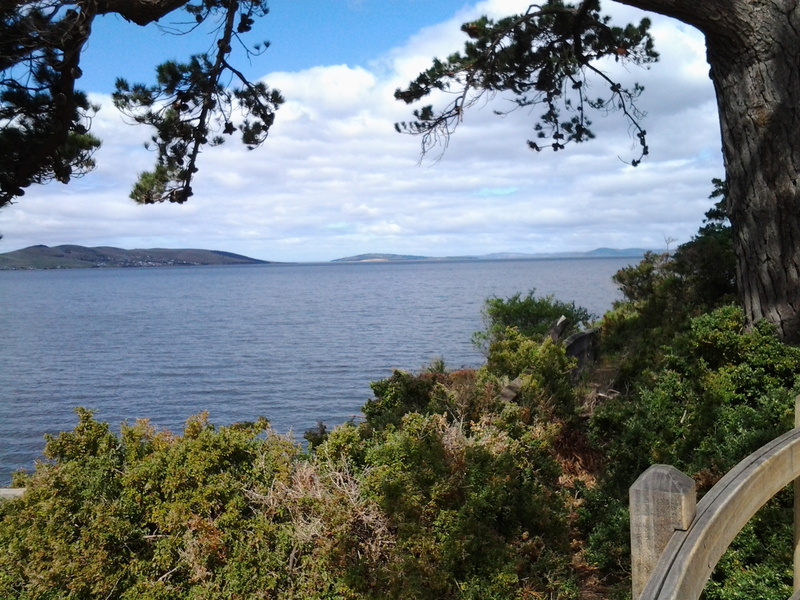 This entry was posted in Derwent River, Hobart, Mount Wellington, Walking and tagged AFL, Australian Rules Football, Bellerive Beach, Bellerive Cricket Ground, Bellerive Fish Bar, Blundstone Arena, Clarence Foreshore Trail, Droughty Hill, Fort Hill, Gellibrand Point, Howrah, Howrah Beach, Mount Wellington, Ralph's Bay, Rokeby Hills, Second Bluff, Shoreline Shopping Centre, South Arm, Tranmere on October 2, 2014 by Tasmanian traveller.